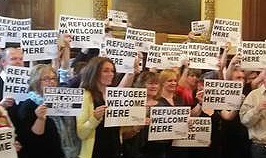 UNISON delegates from local government branches across Scotland took time out from their conference in Glasgow today to say "Refugees welcome here". UNISON Scottish Secretary Mike Kirby welcomed the leadership shown by First Minister Nicola Sturgeon and opposition leader Kezia Dugdale as they united in the Scottish Parliament to pledge humanitarian support. This Positive Action in Housing briefing gives branches an indication of some immediate actions you can take in political campaigning and in supporting emergency assistance.